According to a news story in the Tribune, last week Tuesday Chicago police headed what I would call a Three E’ Blitz to stop cyclists from running red lights and blocking crosswalks at the intersection of Kinzie, Des Plaines and Milwaukee. That location was chosen because it is a complicated intersection on the new protected bike lane that is heavily used by cyclists, many of whom run the red lights and interfere with the path of pedestrians. Take a look at the one minute video of the operation below. One off topic thing that jumped out at me was the number of cyclists, sometimes 5 or 6 waiting at the light at a time. I call the operation a Three E’s Blitz because the Police worked with the Chicago Department of Transportation and the Chicago Bicycle Ambassadors to enforce the laws, educate the road users, and encourage them to obey the laws in the future. There are typically 5 Es in any traffic safety solution: Engineering, Education, Encouragement, Enforcement and Evaluation. CDOT had already addressed Engineering with the traffic signals, crosswalks and protected bike lane. Getting people to obey the laws associated with those facilities is the harder part. Simple targeted enforcement efforts involving lots of tickets do work, but only for a limited time. Including the Chicago Bicycle Ambassadors in the operation adds the education and encouragement elements which should help increase the effectiveness of the blitz. Personally, I am not in favor of warning tickets for motorists or bicyclists when it comes to these enforcement efforts for basic traffic laws we all know. I prefer to just hand out a ticket with a fine. The Chicago effort resulted in 240 warnings and only one ticket given to a particularly uncooperative cyclist. You shouldn’t have to be a daredevil to cross the road. Why did the chicken cross the road? To remind motorists the state laws requires they stop for pedestrians in a crosswalk. I have done similar operations for the City of Milwaukee StreetShare Pedestrian Safety Week. 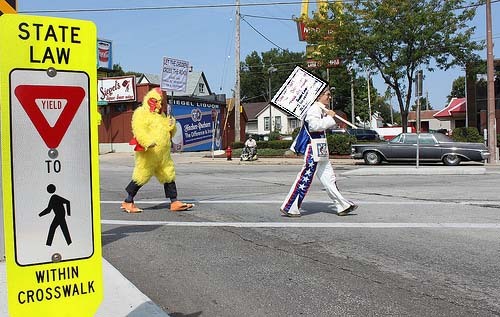 I have dressed up in a chicken costume, a daredevil costume and even as a racing sausage to get the message out to motorists to yield the right of way to pedestrians in a crosswalk. But I have never done a Three Es Bike Blitz. Now that Wisconsin has a Share and Be Aware program with regional ambassadors, I think I will talk to the Bike Fed (who run the program) and our Milwaukee Police Department about doing one of these operations at an intersection in Milwaukee this summer, but which one? KK and Becher? Other suggestions? Not sure KK and Beecher would be the best – I ride through that intersection daily and the times I ride it, there are very few (if any) pedestrians, most cyclists (that I see) obey the traffic lights and I wouldn’t define that intersection as “complicated”. If anything, it would be great to give out warnings to motorists that tend to under-cut traffic at the lights going North and South. In my mind, that is the most dangerous element of that intersection. Perhaps the KK/Lincoln/Howell intersection would be better? Or something downtown like Water and Wisconsin? I commute Lincoln from KK to 43rd. The intersection of Lincoln and Forest Home is a nightmare. If the potholes don’t get you then you’ll have to give the one finger wave to at least one or two drivers. Not sure why it is that intersection, but I seriously dread riding through it. I will admit, life has improved dramatically with the repainting of the bike lanes a few weeks ago. I guess this intersection would be better for ticketing drivers, not cyclists. Could use some of those signs too for people to run over.